No trip to Branson would be complete without a visit to Dolly Parton’s Stampede. From its delicious four-course meal to its amazing stunts and epic show in a 35,000-square-foot arena, the Dolly Parton's Stampede is a highlight for kids age three to 103. Experience an interactive, friendly competition as you root for your side. 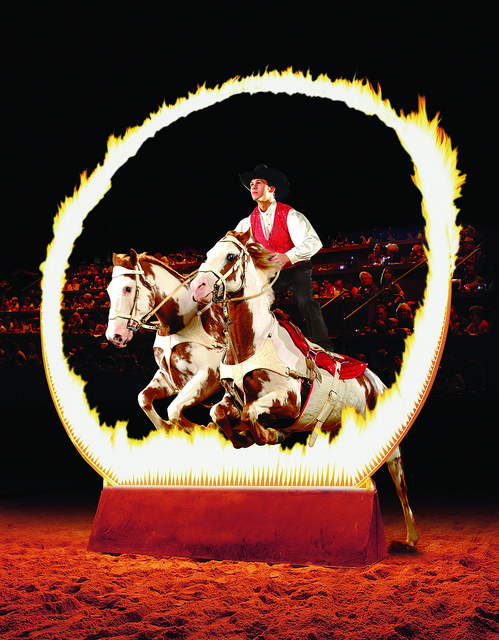 Thrill as you watch horse riding stunts at top speeds, including jumps through a ring of fire. Delight at the comedy antics of Skeeter and Nugget. The show also features a menagerie of animals including horses, pigs, pint-sized ponies, doves, buffalo, longhorns and even a dancing chicken. Ready to have some fun? Here’s everything you need to know about this top Branson attraction. From late February through December, Dolly Parton's Stampede is offered multiple times almost every day of the year. Be sure to check the show schedule for availability on a particular day. To catch the pre-show in the Carriage Room—featuring comedy, magic and more—arrive an hour early. From late February through October, Dolly Parton's Stampede presents a friendly North and South battle with Civil War-era costumes, horse stunts, the comedy of Skeeter and Nugget, pig races and more. From November through December, be sure to catch the Christmas show with a competition between the North and South Poles, dancing toys, elves, camels and a live nativity scene, to name just a few of the merry highlights. Book your tickets directly on the Dolly Parton's Stampede website and pick them up at the box office before the show. They also offer a variety of package deals with other attractions including Silver Dollar City and the Titanic Museum. Or, purchase your tickets over the phone by calling Dolly Parton's Stampede at 417-336-3000. While it’s possible to buy tickets at the box office, they tend to sell out fast, so you might want to visit a few days in advance. Every show comes with a mouthwatering four-course dinner. Enjoy a southern-themed meal featuring a whole rotisserie chicken, hickory smoked pork loin, creamy vegetable soup, baked potato, corn on the cob, biscuit and an apple turnover. Be forewarned: all meals must be eaten with your hands (much to the delight of kids and the young-at-heart). If you’d like a souvenir, purchase a beverage for the pre-show and you’ll receive it in a Dolly Parton's Stampede boot mug (non-alcoholic options only). A beverage is also served during the show in a regular cup, so you wont go thirsty if you opt out of the boot mug. Vegetarian meals are available upon request when you purchase your ticket. This show tends to sell out fast, so be sure to buy your tickets in advance. Arrive at least an hour early to spend time with the horses and enjoy the pre-show. You will have to wait in line beforehand to pick up your tickets. Part of the fun is getting to eat your meal entirely with your hands but if you prefer utensils, request them from your server at the beginning with your drink order. Parking is in the back of the building, with limited parking in front. If walking is challenging for anyone in your party, you might want to drop them off before looking for a spot. The Dolly Parton's Stampede theater is fully accessible for individuals with special needs. Just let them know if members of your party have a wheelchair, need hearing assistance or require other accommodations. The staff is very helpful. For a fun, unique event space Dolly Parton's Stampede features a 35,000 square foot arena and accompanying Carriage Room. Groups of 15 or more receive special prices. With only 500 people, Dolly Parton's Stampede will add a dinner show just for your group and can accommodate groups up to 1,100 people. If you’re looking for a space to rent outside of the show, the Carriage Room is a popular favorite. Meeting space is also free to large groups who attend the dinner attraction. 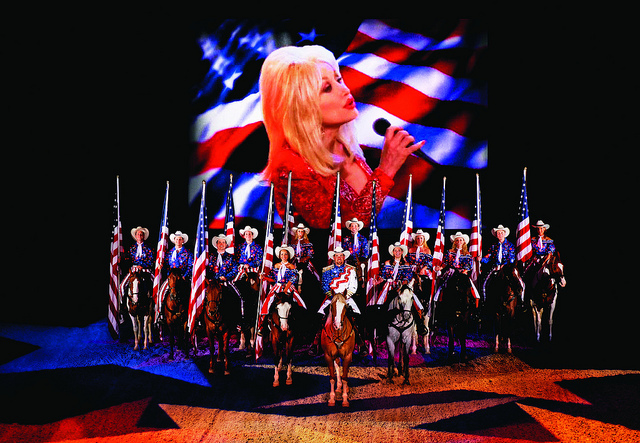 Dolly Parton's Stampede is also a great host for military reunions. While you're in Branson, enjoy dinner and a show at these other great attractions.